Carbonated soda is full of artificial flavors and chemicals. A trend for those looking to make healthier choices regarding beverage choices. The Bonne O Sparkling Beverage System is a way to make those better choices. It allows you to add whatever you want to your water and make it sparkle with carbonation. The Bonne O is a new soda maker that is able to infuse drinks while carbonating them. It is not affiliated with SodaStream and as such has its own unique refill system. 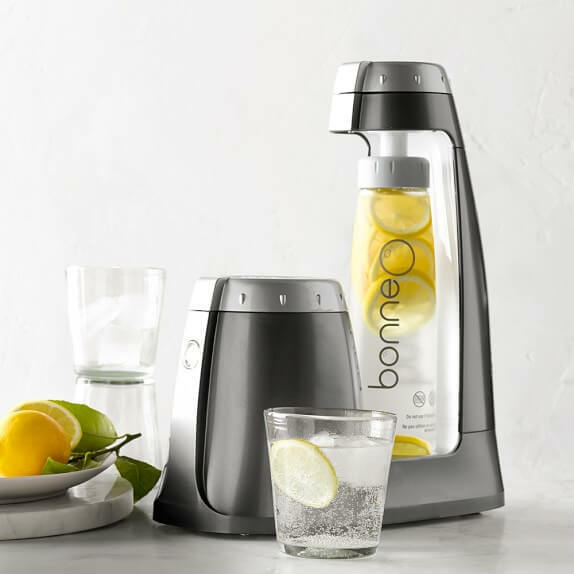 The Soda Maker Club recommends the Bonne O to the people who do not enjoy the SodaStream refill system but still want a high quality machine or those who like to make homemade, naturally flavored drinks. Bonne O has been transformed since its inception in 2010. They now offer a modern sleek design that is due for a new model to be released in 2018/2019. They intend on continuing to improve the system based on consumer feedback and customer input. They value their customers and want to make the best product available. So far, they have successfully been the first company to eliminate the CO2 containers from a carbonation machine. So, not only are they looking out for safety, they are looking out for ways to make the product adaptable for healthier living. Comes with the soda maker, the carbonating bottle and 3 carbonator tablets. The Bonne O is easy to use but you need to change the carbonator after each use which implies extra work. Also, after the button is pressed, you must wait a significant amount of time which leads to an inefficient carbonation process. Plug in the soda machine, unscrew the cap and take out the carbonator container. Fill one part of it with water and insert a carbonator in the other. Put it back in and screw the cap back on. Fill the carbonating bottle with water and put it onto the base. Screw the upper part of the soda maker down until it is firmly pushing down on the bottle. Press the button and wait a couple of minutes. Unscrew the upper part of the soda maker, remove the bottle and pour. To refill use, the Bonne O carbonators (kind of look like tablets)that can be bought on their website in bulk for roughly 66 cents each. Each carbonator can carbonate one full bottle (750ml). Bonne O allows you to put fresh fruit in the container or you can add a homemade syrup to the flavor chamber, along with the carbonator. Then, you fill the bottle with cold, unsweetened liquids, usually water. When the bottle is fitted back into the unit, you just simply push the lit button and the machine will do its magic. After it is done, just press the vent in the cap and open it up and enjoy. So, you can use plain water in the container or juice or even alcohol. It can make any liquid into a carbonated treat. You can enjoy a fresh, healthy drink right from your own kitchen. You are no longer forced to subject yourself to using sweet, syrupy mixes to flavor your water with artificial sweeteners. Bonne O gives you an alternative to this. In addition, Bonne O eliminates the need to use a high-pressure CO2 canister. These canisters can be dangerous. In addition, because of their hazardous nature, there are restrictions on shipping them. Instead, Bonne O uses carbonator discs which will carbonate a full bottle of liquid. These carbonators can easily be ordered online and shipped to your home. The Bonne O website allows you to order a starter pack, which comes with the unit, a reusable bottle, and five carbonators. The price of the package is reasonable. The website also allows you to order replacement carbonators and bottles. Bonne O is a Toronto based company that can ship to the Canadian provinces and the United States. The Bonne O really differentiates itself through its use of unique carbonator tablets that create almost no waste and through the fact that it is able to infuse drinks with natural flavors when you put fruit or other ingredients in it. On top of that, it has a unique design and boasts high build quality despite its plastic construction. Most users found the Bonne O to be durable, attractive and liked the fact that it creates almost no waste. They also enjoyed the fact that you could infuse your drinks with natural flavors and loved the taste of the drinks they obtained. However, one person complained about his water becoming flat very quickly and others mentioned that when he used it to make pure sparkling water, the water ended up having a strange taste. They also found the time of use to be quite long. If you are looking for a way to make tasty carbonated drinks at home, Bonne O is for you. You can put your favorite fruits, herbs, spices, tea, or wine together and carbonate them in the bottle. Make your own concoction, or follow a recipe, it is whatever you want it to be. It makes getting that daily intake of water that much easier. There are a lot of pre-bottled options on the market now, but when you use Bonne O, you can do away with artificial sweeteners, artificial colors, or preservatives. It makes your life that much healthier. I had the same issues with soda stream , not only are the tank exchanges troublesome but also found that most of the time they would expire quickly ( with very light use ) and comparatively, I would spend a lot more on soda stream refills ! So , I gave this a try and I love it ! no wasting or disposing of tanks and dramatic decrease in refill budget ! I also was happy to hear that this company was Canada Based . I found out Soda stream was based in middle east . No issues with smell to report. bicarbonate / citric acid ( ingredients that produce C02 ) are inert in terms of smell .